My daily morning routine starts with taking my prenatal vitamin (you don’t have to be pregnant to take these!!) I noticed once I started taking them my hair, nails and skin were all positively affected! I had a major oatmeal craving during my pregnancy and post pregnancy so I have it for breakfast almost every morning (oatmeal is supposed to be amazing for your skin). I also try to drink half my body weight (in ounces) of water each day. I always notice such a difference in my skin when I’m drinking the correct amount of water to stay hydrated and cleansed. Shortly after I had Isla I started using the Roloxin Lift to keep my skin smooth and firm (totally helped with dark circles too). I wasn’t getting much sleep the first couple of months so this totally helped to keep my skin looking firm and refreshed. Maybe. The Roloxin Lift is an instant wrinkle-smoothing mask that reduces the appearance of wrinkles and pores and leaves my skin feeling more smooth and firm than ever! I love that it’s super easy to use and doesn’t take vey long. The packages are pre-measured so all you have to do is squeeze it out and rub evenly on to your face! I leave it on for about 10 minutes and can instantly tell that my skin is refreshed and brighter than before. It lasts the entire day and you can use it as often as you like (I use it 2 times per week). I would love hear some of the tricks you use to keep your skin glowing! Brought to you by Roloxin. I don’t think that’s cliche at all. I’ve never been pregnant before but everyone I know who has been, definitely has a certain glow about them. This sounds like a great product. Thanks for sharing! Great post, I loved reading this and your breakfast looks so tasty! You are absolutely glowing, Rach! You’ve never looked happier! One really can see your pregnancy glow! That masque looks pretty amazing! Your skin looks flawless so whatever your doing is totally working! Great tips, Rachel! I never thought about taking prenatal vitamins before, but it totally makes sense. I agree with you on the water too, I feel so sick when I don’t drink enough. Have a great day! You are a natural beauty and your inner glow does show on the outside! Using the right skincare products helps a lot too! 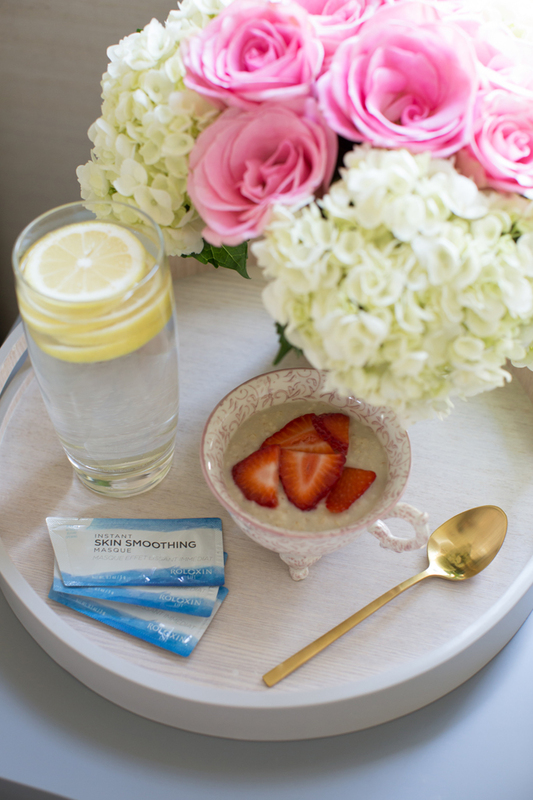 I love oatmeal to start off my morning – so good for you and filling too! Your skin looks beautiful always! Have a nice week! 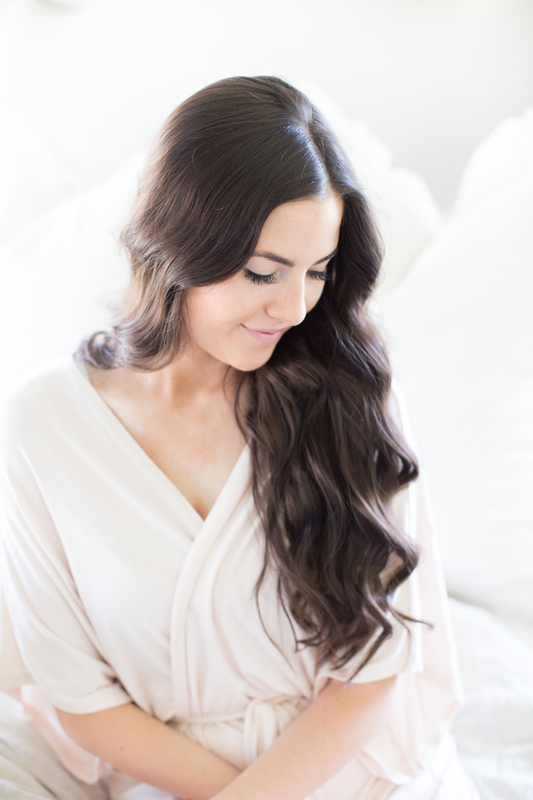 Your bedroom is gorgeous and so serene! Cute robe! Love those gorgeous flowers too! Your skin is so gorgeous! Definitely going to look into Roloxin Lift. I love starting my day with hot lemon honey water and ending it with detox tea. . . I swear it does wonders for my skin. I also eat oatmeal pretty frequently. Great tips! You have totally kept the glow! I need to get back to drinking more water! It helps my skin stay smooth and clear when I do! Love this!! You are so fierce! I definitely have to give this product a try! I’m always trying to keep my skin hydrated and I notice a difference when I drink lots of water, too. Sounds like this mask may be a welcome addition to my skincare routine. Love this post. I find it really motivating to hear and see what works for others related to health and beauty. What is your normal lunch, dinner, and snack routine. Could you give me an idea of your daily diet and workout routine? I knew you didn’t have to be pregnant to take prenatal vitamins but I never knew they had such an impact on your skin and nails. Good tip! I drink a lot of water too by the way and it keeps my diet on track and my body ready to go. love this room! would be so cool is you did a interior design sort of post! I started to try begin the day with clean food. Any oatmeal recipe you can share? This is a nice post. I have been drinking lemon water for 2years now. Water is a must for glowing skin! I live in the desert, so it’s important to keep hydrated. These are great tips, thanks for sharing! My skin will look great one week and then the next week it can break out so much. Water is definitely important for keeping good skin though! I didn’t know oatmeal was a good skin food – I’ll have to start eating it more often! Thank you for these great tips!! I noticed that you kept your pregnancy glow even when Isla was undoubtedly waking up frequently during the night. You truly look so happy! The inner glow always reflects on the outside, too. I completely agree about the amount of water that is needed. I’m going to start eating oatmeal in the mornings again. I love hearing about new skincare products and I think I need to add this to my regimen. My favorite way to keep my skin glowing is to use a gentle exfoliator every morning. It gets rid of any dead skin cells and allows my skincare products to be absorbed more effectively. Beautiful pictures in this post, Rach! I agree that by drinking lots of water, and staying hydrated my skin always looks its best. I’ll have to try prenatal vitamins, I’d love to get my nails and hair stronger! Beautiful pictures. Thanks for sharing this product. I love that robe! And that oatmeal looks yummy! Your skin always looks flawless. I like that your make-up looks minimal. Rach, I’ve said many times on here how amazing your hair and skin look and now I understand why! I’ve been told that pregnancy vitamins do help a lot and can be taken without being pregnant, so I think I might give them a try when I’m finished with my bottle of vitamins. It’s funny because as I was reading this post, I was drinking my glass of water and chugged it more when I got to the part when you mentioned it, lol! I too drink my weight in oz everyday, it does do wonders for your skin! Hoping you have an awesome Monday and week up ahead! I am all about drinking a good amount of water and exfoliating. Both are super important. You look gorgeous! I’m definitely going to have to add oatmeal and lemon water water to my regimen so I can get a glow like yours! I agree with you, pregnancy glow is awesome! I loved my face while pregnant. I had to change up my routine a bit after pregnancy. Maybe I’ll try a few of these pointers, thanks for sharing. I will start to eat oatmeal too! Interested to know which prenatal vitamins you use. ps-I am a huge fan! You are amazing! Gorgeous! Do you have any recommendations for someone on a budget? My husband and I are both still in school, but I want to give my face the best, but just for less? Heading over to Sephora to browse. Thanks! Hello Rachel! I love the carpet in your room. What type is it? Berber? We are thinking of taking out our older carpet and putting in tile or hardwoods in our bedroom, but cold on feet!!! I love the look of your beige carpeting. Love your style! 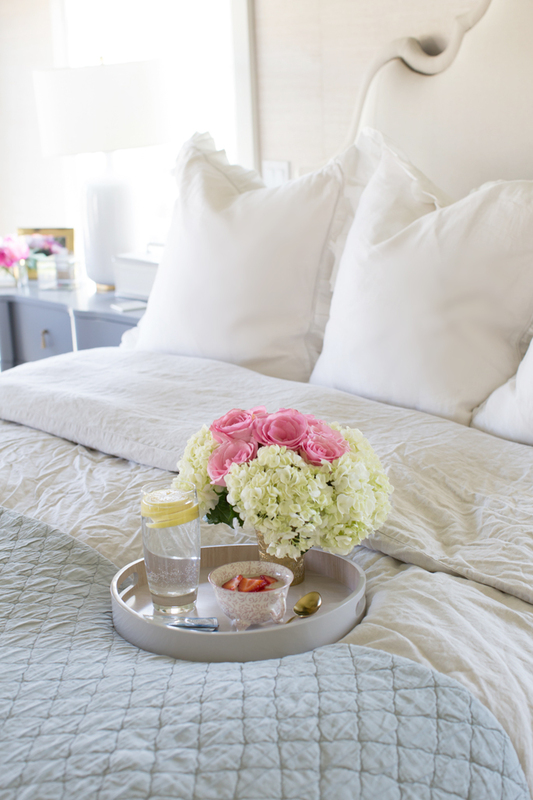 What color are your shams and duvet? White/ivory/natural? xo!